On the 10th birthday of GURPS Fourth Edition, the Ogre rolled off into the distance and the little plants and critters it had trampled sprang back to life. Oh, sometimes it was twisted, radioactive life, but we're all gamers here -- we can handle that! Which is my way of saying that after a slow-ish 2013, GURPS picked up in 2014. 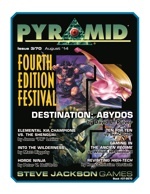 In fact, we averaged one single-author supplement and one issue of Pyramid a month. First, there was a ton of straight-up "core" material useful in just about any campaign. 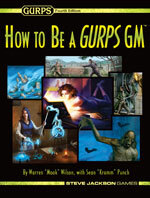 Newcomers to the game got How to Be a GURPS GM -- the first-ever "how-to" guide published for GURPS by SJ Games. More seasoned hands received GMing advice in the form of GURPS Template Toolkit 1: Characters. 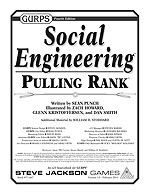 And gamers of all experience levels benefited from the quick-and-easy rules for organizational intervention in GURPS Social Engineering: Pulling Rank and the handy collections of traits in GURPS Power-Ups 6: Quirks, GURPS Power-Ups 7: Wildcard Skills, and GURPS Power-Ups 8: Limitations. Specific genres also enjoyed a lot of support. On the fantasy side, there was GURPS Dungeon Fantasy 16: Wilderness Adventures, GURPS Magic: Death Spells, and GURPS Magical Styles: Dungeon Magic . . . for those times when you need to get really organized, kill everything inside the dungeon and out, and take its stuff (or something like that). 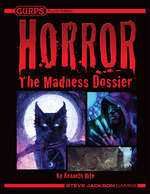 Higher-tech gamers got GURPS High-Tech: Adventure Guns to help them with their killin' -- and to keep them honest, GURPS Horror: The Madness Dossier, whose horrors don't care how big your gun is. And truly high-tech gamers were treated to Transhuman Space: Wings of the Rising Sun (which, come to think of it, describes an organization that would work well with Pulling Rank). And as I said, Pyramid delivered. It delivered core rules concepts in the form of #3/65: Alternate GURPS III and #3/70: Fourth Edition Festival. It delivered fantasy in #3/66: The Laws of Magic, #3/68: Natural Magic, and #3/72: Alternate Dungeons. And it delivered support for settings (#3/63: Infinite Worlds II and #3/74: Wild West), character types (#3/64: Pirates and Swashbucklers, #3/67: Tools of the Trade – Villains, and #3/73: Monster Hunters II), abilities (#3/69: Psionics II), and vehicles (#3/71: Spaceships II). So if you're sitting around during the holidays, gloating over cash tucked into cards by well-meaning family and friends, why not consider completing your collection in the new year?